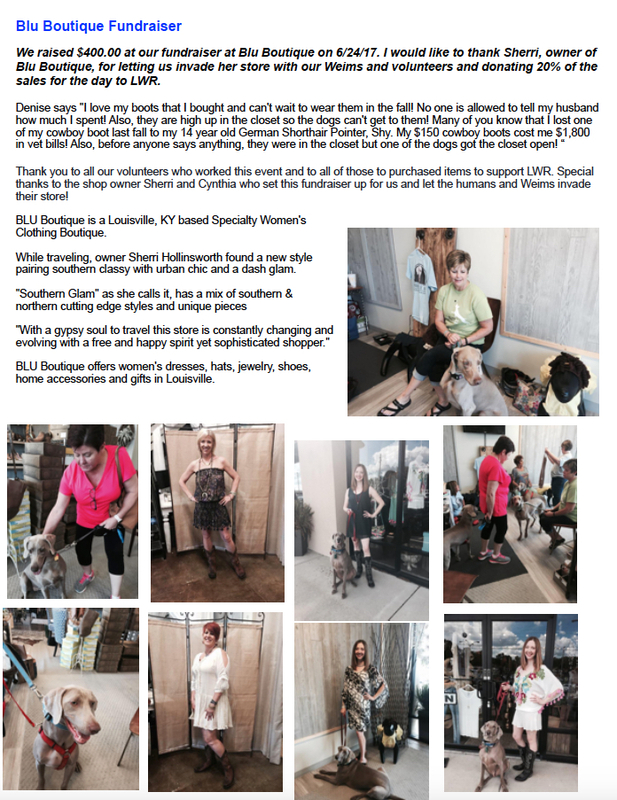 BRINGING A NEW WEIM HOME | Louisville Weimaraner Rescue Inc.
An adopted Weimaraner brings with it his or her baggage from their former lives. They have often been through a lot, even if they have not been abused. They form strong attachments to their families and may go through a short grieving process when they leave them. They may be scared, confused and/or depressed. They are individuals. They have their own personalities, quirks and histories which have served to mold their character. What works for one, may not work for another. You just have to be patient, open and listen to their needs. Determine where your Weim will be spending most of his time. Because he will be under a lot of stress with the change of environment (from shelter or foster home to your house), he may forget any housetraining he’s learned. You should already have a crate set up, if one is needed, in what will be its normal place. Weims do not like to be crated in the basement (even a finished one) or too far from where their family is and where they spend the most time. Some Weims can not be crated at all without seriously injuring themselves. Dog-proof the area where your Weim will spend most of his time during the first few months. This may mean taping loose electrical cords to baseboards; storing household chemicals on high shelves; removing plants, rugs, and breakables; setting up the crate; and installing baby gates. Training your Weim will start the first moment you have him. Take time to create a vocabulary list everyone will use when giving your Weim directions. This will help prevent confusion, and help your Weim learn his commands more quickly. When you adopt your Weim, bring an ID tag with your phone number on it so that he has an extra measure of safety for the ride home and the first few uneasy days. If he is micro chipped, be sure to register your contact information with the chip’s company if the rescue or shelter does not do that for you. LWR will register your Weim’s micro chip with your contact information about 2 weeks post-adoption. Do not let your Weim off leash when not in a securely fenced area until you are sure he is properly trained to respond to you. They love to run. No matter how much they may have bonded with you, they can be easily distracted by wildlife or other stimulus and take off. You should plan on being home with your Weim for the first few days to allow time for him to adjust to new living arrangements and family members. Do not bring him home and then leave him alone while you run errands or go out to dinner. Stay home. He needs to feel a sense of security while adjusting to new surroundings. On the second day, you can try crating him or leaving him for short periods of time. Establish your house rules immediately, but gently and firmly. Reinforce good behavior with praise or treats, but do not overly fuss or make a big deal out of it. Firmly establish boundaries like “off” for furniture he is not going to be allowed on, for example. Each Weim will have a different timeframe for adjusting. You want enough time to introduce him to family members, the house, crating and the yard. You should be able to move to what your normal workday routine is after the second day. If you wait too long to return to a normal routine, separation anxiety may arise. It depends on the Weim; consult with the Weim’s foster family (if you are adopting) for ideas on how to make his transition easier. It will take time to work out your relationship. Have his bed, food and water bowls already in their places. If you have multiple dogs, make sure you have new toys that are just for your new Weim. Do not allow other family pets to lie on the bedding or use the new bowls or toys. Allow your new Weim the first opportunity to scent his items. Expect your Weim to check out everything in the house. He will sniff everything, he will poke his nose into everything, he will investigate every inch of the house and yard. They are hunting dogs and search by scent. Sniffing is not always an indication that they are looking for a spot to potty. Make sure they have had the opportunity to potty outside before entering the house for the first time. Every person living with the Weim should be home upon the arrival of your new Weim. Weims are very protective and family-oriented animals. They need to know immediately everyone who belongs to the family, including children, spouses, and other family members. This makes it clear to the Weim who the family members are and establishes a family boundary with which they will associate. Allow the Weim to approach each person on his own terms. Do not allow children to run up to, yell, or scream at the Weim. Let the Weim come to you. When introducing a Weim to a multi-dog family, it is best that they meet on neutral territory. Use a park, baseball field, or other outdoor facility that is not familiar to either dog. Keep both dogs on their leads. Allow them to sniff each other on loose leashes. If the weather is inclement, you can use a friend’s house where there are no other dogs, or dogs with which your first dog is unfamiliar. Ask the owner to keep their animals out of sight. This allows the dogs to meet in similar circumstances, where territorial boundaries are not established for either dog. You can use a towel or cloth to introduce your dog’s scent to your new Weim. You can rub it on your dog or his bed and take it with you when you pick up your new Weim. Have a quiet time place for your Weim established BEFORE he comes home. It may be next to or near your other dog, or in separate rooms, or his own bed in the family room. Their crate is an excellent place to start – it’s only used by them and no one else; it’s their own space. Weims are very family-oriented, which includes other dogs, and they seem to do best when they are placed with another dog. Practice crating during times when it is not necessary. Ask the Weim to go into their crate with the command that you choose. Have them stay for just a moment or two, and then give a treat reward with upbeat praise. Repeat and gradually lengthen the time they stay inside. Make sure that family members, especially children, know that if your Weim goes to his crate or bed voluntarily, they are NOT to disturb them. Do not allow children to crawl into their crate or wallow on their bed. Just like people, dogs need quiet time too. Respect their need for a break. Make certain that you follow a very solid routine for feeding your Weim, as well as an activity schedule. This makes potty training, quiet time and temperament so much more predictable. Sure there are times when schedules simply have to change, so stash a few treats in your car for rewards of patience while they wait in the vehicle on your errand runs. Weims usually drink lots of water, although they will adjust their water intake based upon activity levels, environmental conditions, and water content in their food. Weims also have an unusual peculiarity about the manner in which they drink – they dribble water from the sides of their mouths when they raise their heads from the bowl. Most Weim owners learn to live with their kitchen floors being wet all the time, but there are things that you can do to minimize the mess. Place a towel or tray under the water bowl. Using a long trough-shaped dish instead of a round bowl gives them a place to dribble. You can also teach your Weim to wait just a second before walking away from the water bowl, but it does take consistent, gentle reminders from you. Make sure that you provide lots of fresh water daily. Try to include at least one hour of vigorous activity daily with your Weim. Running, walking or ball chasing are all great ways to get them exercise, as well as yourself. If possible, try to vary your activities as Weims have a tendency to get bored because of their intelligence level. If you rescue an abused Weim, there are so many things that you will have to discover on your own. What makes them scared? What sets off retaliatory behavior? What keeps them from progressing in confidence? Often they come in malnourished with poor skin and coat condition and quirks in their behavior that may not make sense to you. It is important for you to be very patient. Start slow with introductions. Everything from meeting new people; getting rich, nutritious food; certain toys; and even your tone of voice can be scary and confusing to an abused Weim. The number one cure all for an abused Weim is love; kind and patient love that surpasses all odd behavior. Our number one piece of advice is to seek the help of a professional, especially if you are new to owning an abused Weim. It is not uncommon for a new Weim to “forget” his house training and have an accident in the house the first day or two. Make certain you show him where to go when he needs to potty. He will not instinctively know which door to go to, and you will not know what his usual actions are to let you know he needs to go out. You will have to be very alert to learn his signals. Older Weims especially will have distinct behavior patterns already established for this need. The first couple of successful times you can use a treat reward to let your Weim know that he is doing just great. It is normal for your new Weim to have anxiety the first few days. He may pace, pant, have excessive drooling or water drinking. Do not use common ‘Good Dog’ phrases like “It’s OK” or “It’s alright” – you do not want to reinforce unwanted behavior. Try distracting him, redirecting his attention using treats, or go for a long walk or play a game. Chewing, especially for an adult Weim, is a prime symptom of anxiety. You should always have healthy, safe toys for him that allow good mental distraction to work through his frustration or fear. Try Kong toys, which are hard rubber chew toys in a variety of sizes and shapes, but all include the ever important secret chamber – the hole where the treats go! Smear the inside with peanut butter, fill with kibble or apple chunks or low calorie treats to provide hours of healthy chewing. Freezing the Kong ahead of time will extend the amount of time it takes for him to empty the Kong’s contents. This saves your furniture and belongings, but also relieves his stress. We recommend some form of supervised and/or assisted manners training for EVERY Weim. It is good to let your new Weim adjust to their new surroundings for a while before enrolling them in positive reinforcement training. You’ll know when it’s time. He will be restless or start new, unwanted behaviors or even cease to perform simple commands he once did well. Weimaraners are very active dogs. Chewing and destructive behavior are very often indicative of a lack of exercise, so it benefits both of you mentally to schedule regular, interactive exercise. It is recommended that you provide a minimum of one hour of physical activity for your Weim daily, if not more. Physical activity is vital to not only their physical health, but also their mental development, as is obedience and task training. There are a number of ways to provide exercise for your Weim. Walking or jogging daily with your Weimaraner is an excellent way to provide the exercise he needs and get your exercise also. There are several wonderful products on the market that allow you to walk or jog hands-free – even with multiple dogs! SuperLeash carries couplers that can be used when walking multiple dogs. There are belts that you can wear that the leashes attach to, and many more options are available at your local pet store. Locate a secure baseball field or park near your home. Baseball areas are most accessible during the winter months when children’s leagues are off season. Walk to the park, secure the gates and let them go. It is amazing how fast Weims can run! Take a tennis ball and a Chuckit! with you. The Chuckit! sails the ball across the field and prevents you from having to touch a slimy ball! These are available at your local pet store. You can also practice obedience and agility moves during this time. Some areas have dog-friendly parks, but remember to scoop the poop. NEVER leash your dog to a bicycle or motor scooter. Exhaustion and overheating will occur rapidly, and you will not be as aware of their status. Play time in your own yard can be fun for both of you. Provided you have a large fenced area, you can work on retrieval, manners, obedience or just simply throw the ball. Weimaraners need interaction from their people, and this hour can be well spent as bonding/play time. NOTE: Weimaraners are susceptible to BLOAT. As of yet, no one is certain how or why bloat occurs, but it is deadly! A reasonable and widely-accepted practice is to NOT heavily exercise a Weim one hour before feeding or two hours after feeding. This allows their system to be at a natural resting state while trying to process food. Watch for excessive water drinking directly after play or during times of anxiety. Sure they should be thirsty after play, but not to the point of consuming a gallon of water in one sitting.